We now have the new Halloween fabric called "Happy Howloween" by Deb Strain for Moda Fabric cann't wait to get started on a project. I thought maybe I'd make my granddaughter a witches costume because that is what she wants to be every Halloween. 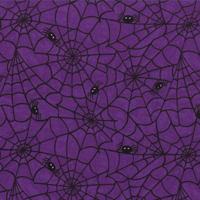 She really loves purple so I thought this purple with she spiders would look really cool. Moda has such cool looking fabric cann't wait till market. Thanks for leaving us a comment.